When you’re working with a Hostile Angry couple, you’ll save yourself a head of grey hairs if you assess motivation as early as possible. Your approach with the couple will depend upon whether they are motivated, unmotivated, or a third type, “motivated/unmotivated,” which I’ll explain below. A motivated partner comes to therapy for growth and change. They will set goals and do homework. An unmotivated partner doesn’t want to take an active role. They don’t identify problems. They don’t set goals. They may not want to be there at all. They often expect to be blamed. They may have already decided to leave the relationship. The motivated/unmotivated partner is especially common in fighting couples. These partners may present themselves to you as if they are motivated for change. They may say, “All we do is fight. We can’t communicate.” They ask for help with communication but often the primary source of their motivation is a desire to change the other person. They often believe the other person owes it to them to do something now. In fact, part of their motivation may be to solidify an earlier symbiosis rather than focus on their own personal growth. 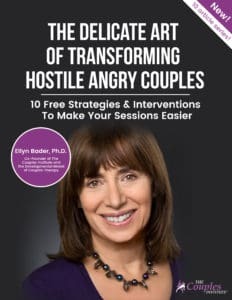 When you’re working with angry couples where both partners are either unmotivated or motivated/unmotivated, it will be nearly impossible to create change without increasing their motivation first. So you must spend some time in the first few sessions identifying their type of motivation and then increasing the motivation level of each partner. Help them invest in changing themselves, or your best efforts will be thwarted. What is the kind of relationship you want to create? What does that relationship look like? And then, what will be required of you to help bring that about? The answers will reveal some important things. For example, if neither of them has an image of any sharing, collaborating, supporting the other, or of offering any positive acknowledgement, then you know you’re up against something that’s really tough. You’re asking them to change something uncomfortable or even unbearable into something they can’t even picture! Or maybe one partner wants to dump the other one on you, and is totally out of the relationship. This is extremely important to know, so that you’re not asking one person to open up and risk, while the other one is silently planning to exit. Or maybe you find out they’re both motivated; each partner is actually there to change and significantly evolve the relationship. For these different situations, you’ll approach your sessions very differently. If there’s one thing to take from this lesson, it’s that taking time, going slowly, and understanding the type of motivation is essential for knowing how to structure developmental growth. In my Developmental Model training program, participants learn how to work with all 3 types of motivation. They learn how to focus on changing how the couple interacts with each other so that there is a positive base to build on. For more information about this practical, innovative program, click Developmental Model. The program is currently closed, but you can get on the waiting list. You have probably seen couples with varying motivation, even if you didn’t recognize the three types. Please share your observations from working with different types of motivation, or comment on challenges or successes with the different types. Excellent articles. Thank you for sharing them.